The Gall Thomson Underbuoy Breakaway Coupling is designed not to activate due to cyclic fatigue, bending moments or torsional stresses caused by the motion of subsea currents. The UBC is designed to activate when its pre-set parting load is exceeded. Excessive axial load may be caused by the anchor chains being broken and the SPM being forced beyond its designed envelop, therefore applying excessive load to the underbuoy hose string. This can be caused by vessel collision or some other extreme event such as tsunami, hurricane or other event. When the UBC activates, the valves close. Closure of the valves stops product flow and minimises spillage; activation of the coupling allows the SPM to be outside its designed envelop without causing damage to the underbuoy hoses, PLEM (Pipeline End Manifold) or submarine pipeline. 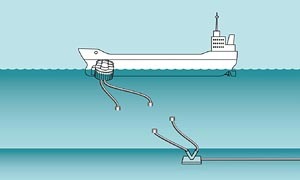 Floating hose strings at Single Point Mooring (SPM) Catenary Anchor Leg Mooring (CALM)/ Single Anchor Leg Mooring (SALM) buoy terminals. by all 250 successful Marine Breakaway parting incidents to date. Terminals around the world employ Gall Thomson MBCs as part of their underbuoy systems. These include a range of sizes, configurations and applications.